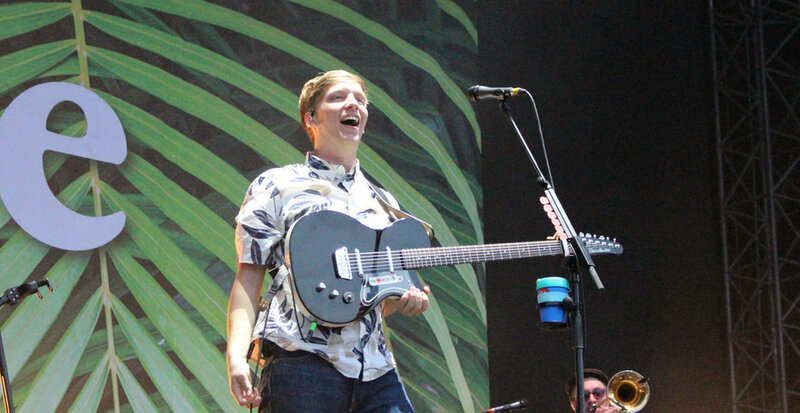 Finishing off his UK Tour, George Ezra stunned fans at Manchester Arena with his cheery pop guitar and deep vocals, creating the perfect party atmosphere. Following pop goddess support act, Sigrid, the stage began to morph into a cozy bedroom, with regal lamps and giant windows, and it felt like the Manchester audience were having their stay at Tamara’s. Before showing his face on stage, George tugged at the audience’s heart strings by dimming the lights and playing Don’t Look Back in Anger through all the speakers. 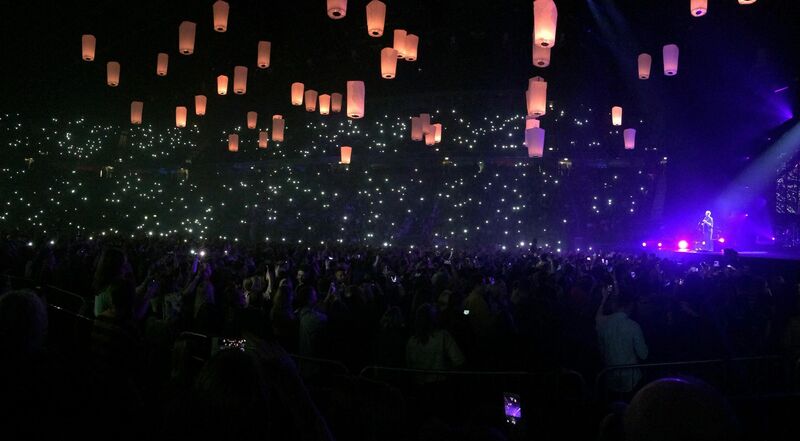 Everyone’s flashlight was on, every word was belted out, and the unity of the Manchester crowd shone through. Alarm clocks filled the ceiling length screens, and as it hit 7:00, the show unraveled with the jaunty guitar and blaring brass section of Don’t Matter Now. In a full black attire, George swept the crowd off their feet and lit the stage in a multicoloured madness that just made you grin. Throughout the night, George took us behind the scenes of his latest album Staying at Tamara’s, telling us about his month long stay at a stranger’s house in Barcelona with just a guitar and a notebook and his adventure around the city walls. His inspirations for the songs came from the stay, but nothing was written until he was back in the UK. Paradise arose after Ezra was in a beautiful location with great people, but sadly fell ill (which had the whole crowd ‘aww-ing’) and recorded a quick melody to pass time. As George and the band built up the crowd harmonising ‘Paradise, roll on roll on, meet me there, roll on roll on‘, the upbeat atmosphere reached the brim, and the final chorus burst out pure joy throughout the arena. Focus didn’t stay on the new album however, with classics such as Listen to the Man and Barcelona peaking their head on the set list. The merge of old songs felt very fresh, as the audience revised the lyrics as if they were brand new. Throughout the gig, props appeared in all the right places, with a record player blasting out the crackly beginnings of Did You Hear the Rain, and beautiful paper lanterns descending above the standing audience in Song 6. Another highlight of the night was the highly excited keyboard player who, when there was a key-less song, would run to the front of the stage and motivate the whole crowd. Each face in the arena couldn’t help but smile as he danced centre stage. George showed that he’s not only an amazing singer-songwriter, but also a funny guy you just want to be friend with. Between each song, we got to know George more, and his Eurovision antics that the crowd couldn’t help but cheer him on for. George ended the night with a tropical party with the singalong Shotgun, that had everyone on their feet. The powerful vocals of the crowd overpowered George as he challenged us to beat the Arena crowd from last week- which we totally did. All of the band conga’d around the stage, making it look effortless to nail a trumpet solo whilst dancing. Completely mesmerized, the Manchester crowd couldn’t help but let loose and dance like no-one was watching, me included. As the show ended, it was impossible to leave without feeling wholesome or having smile on your face after the peppy anthems just uplifted you. The performance cemented why George is at the top of the pop game, holding platinum albums and being a down to earth performer. His cheery personality just drew the crowd in and he gave his heart to every song he had, and as everyone sang back words of Budapest to him, you could see his overwhelming smiles and how much it meant to him. If you didn’t get to make the show last night, don’t feel down because Ezra is spending his summer headlining and performing at many festivals in the UK over the summer, such as Neighbourhood Weekender, Parklife, and Glastonbury. But even if that doesn’t sound like enough, George Ezra also hosts podcasts on his website, where he has had special guests such as Ed Sheeran take part and talk music and lifestyle. For more information on George Ezra, check out his website, Twitter, Facebook, and Instagram.